Vinemetrics develops innovative grape and vine monitoring technology including cluster weight, water status or water stress and shoot growth sensors. Our technology helps grape growers better manage irrigation, fertilization, cultural practices, yield, grape quality and wine quality. Our technology is useful for wine grape, table grape and raisin grape growers, vineyard managers, viticulturists, consultants, PCA's, grape buyers and winemakers. Your vineyard is changing every day. 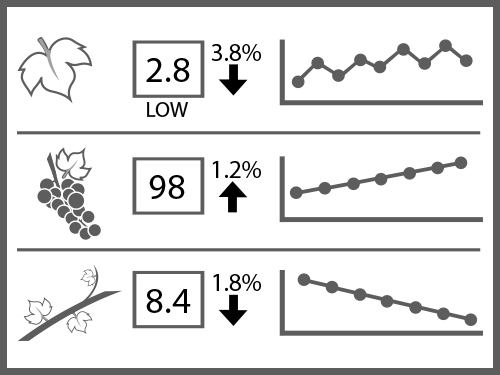 To make the best decisions you need to know the critical vine metrics that drive crop yield, quality and vine health. That's why we formed VineMetrics - to provide grape growers with the best information, tools and prescriptive services to make better decisions. VineMetrics has pioneered plant-based sensor technology. We are the first and only company in the world that can deliver continuous cluster weight, shoot growth and vine water status monitoring. With over 12 years of experience working with grapevine physiology, VineMetrics consultants can help you understand your data and provide value-added recommendations to minimize the uncertainty and risk of grape growing. VineMetrics has revolutionized the science of plant-based monitoring through the development of its proprietary sensor technology. We offer sensors that monitor Cluster Weight, Shoot Growth and Leaf Water Stress. Our sensors are non-invasive, rugged and securely attach to the vine and take continuous readings 24-hours a day for the entire growing season. VineMetrics data and supporting analytics are displayed in an easy-to-read dashboard environment. Compared to old-fashioned charting tools, dashboards are more user-friendly, quicker to navigate and look better in print or email. And if you're always on the go, our dashboards are fully responsive so they look good on tablets and smartphones. Data is perishable. Quick and decisive action can preserve yield and quality and minimize or eliminate costly inputs. That's why VineMetrics offers value-added prescriptive services to maximize your technology investment. We work closely with our clients based on their needs to help them achieve their goals. Whether it's another pair of eyes watching your data or walking your vineyards, VineMetrics consultants can help.